Unplugged Wedding Ceremony: You’ve searched for and hired the perfect wedding photographer to capture those special moments of your big day, and you certainly want them to be able to do their job. After all, the photos they take will be ones you will cherish for years to come. But your well-meaning guests may unknowingly prevent those picture-perfect moments from being photographed as they try to capture those same once-in-a-lifetime moments on their phones, iPads and cameras. Not only can they get in your photographer’s way or ruin the lighting with their own camera flashes, they can turn a would-be beautiful photo of your guests into one that looks more like an advertisement for digital devices. • Put a note in your wedding program letting guests know a professional photographer will be taking photos that you’ll be happy to share with them. Ask them to please refrain from taking photos during the ceremony and reception. • Have your officiant announce that the bride and groom would like guests to please turn cameras, cell phones and digital devices off so they may be fully present on their special day. • Appoint a member of your wedding party to remind guests of your wishes and to refrain from taking photographs. 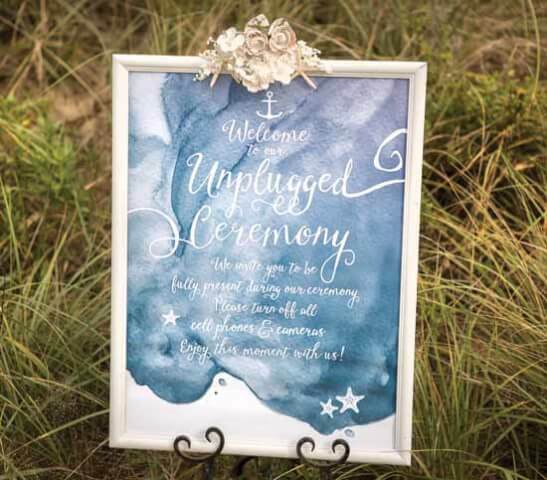 • Place a sign at the entrance of the ceremony or on reception tables gently reminding guests to turn off all digital devices.